Below is my reading of Spinoza’s Optical Letters (39 and 40) as best as I have been able to extract interpretations from them. They are letters that are in general ignored, or when brushed over, taken to be evidence for Spinoza’s incompetence in optical matters. It seems that few have thought to examine in detail Spinoza’s point, or the texts he likely had in mind when formulating his opinion and drawing his diagrams. It should be said right from the start that I am at a disadvantage in this, as I have no formal knowledge of optics, either in a contemporary sense, nor in terms of 17th century theory, other than my investigation into Spinoza lens-grinding and its influence upon his metaphysics. In this research, the reading of this letter has proved integral, for it is one of the very few sources of confirmed scientific description offered by Spinoza. That being said, ALL of my facts and inferences need to be checked and double checked, due to my formal lack of familiarity with the subject. It is my hope that the forays in this commentary reading, the citations of likely texts of influence and conceptual conclusions would be the beginning of a much closer look at the matter, very likely resulting in the improvements upon, if not outright disagreement with, what is offered here. Spinoza is responding to a question we do not know, as we have lost Jelles’s letter. We can conclude from several points of correspondence that it is a section of Descartes’Dioptrics that Jelles’ question seems to have focused on, the Seventh Discourse titled “Of The Means of Perfecting Vision”. There, Descartes describes the interactions between light rays, lenses and the eye for purposes of magnification, preparing for the Eighth Discourse where he will present the importance of hyperbolic lenses for telescopes, and also onto the Ninth, “The Description of Telescopes”, where that hyperbola is put to use in a specific proposed construction. There remains but one other means for augmenting the size of images, namely, by causing the rays that come from diverse points of the object to intersect as far as possible from the back of the eye; but this is incomparably the most important and the most significant of all. For it is the only means which can be used for inaccessable objects as well as for accessable ones, and its effect has no limitations; thus we can, by making use of it, increase the size of images indefinitely. It is good to note that in his description of the strategies of telescope magnification, Descartes is operating under an extended analogy, that the telescope can work like a prosthetic lengthening of the human eye, causing the refraction that would regularly occur at the eye’s surface to happen much farther out, as if the retina were being placed at the end of a very long eye. This is his mechanical concept. Descartes distance-analysis of magnification (and an assertion of the significance of the hyperbola) is then carried forth in the Ninth Discourse, where again Descartes will treat magnification in terms of the proximity to the eye of the crossing of rays, which here he will call the “burning point” of the lens. The descriptions occur both in the context of solutions to far and near sightedness as well as in proposals to the proper construction of telescopes, and generally follow this idea that one is primarily lengthening the eye. What Spinoza is pointing out is that when constructing telescopes, as he understands it, the aim is to increase the magnitude of the angle of rays upon the surface of the eye (the cornea), something not solely achievable merely through the adjustment of the distance of the “burning point” or the crossing of the rays of the lens from the eye. 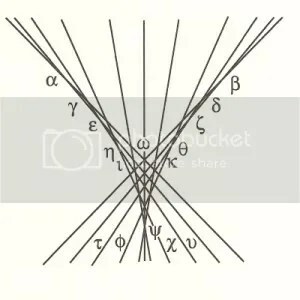 Attention to the angle of intersection is for Spinoza a more accurate discriminator probably because it leads to calculations of refraction which include the angle of incidence upon the lens, giving emphasis upon the varying refractive properties of different shapes and thicknesses of lenses in combination, some of which can increase magnification without lengthening the telescope. Descartes conceived of the objective and eyepiece lenses as mimicking the shape and powers of the eye’s lens(es), just further out in space. Though he states at several points that we do not know the exact shape of the human eye, under this homological view, he still sees a correspondence between his proposed hyperbolic-shaped lenses and those of the eye, likely drawing upon Kepler’s observation that the human crystalline humor was of a hyperbolic shape. The fuller aspects of the factor of refraction – the third factor listed in Descartes three – are left out in such a distance calculation, Spinoza wants us to see. 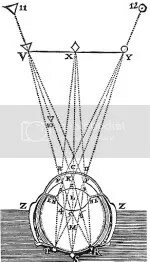 As mentioned, in the combination of lenses, depending upon their shape and powers, the required lengthening of the telescope can be shortened (Spinoza presents just this sort of argument to Hudde in Letter 36, arguing for the efficacy of convex-planolenses). One can also say that this same emphasis on the powers of refraction was also at play in Spinoza’s debate with Huygens over the kinds of objective lenses which were best for microscopes. Huygens finally had to privately admit in a letter written to his brother a year after these two letters, that Spinoza was right, smaller objective lenses with much greater powers of refraction and requiring much shorter tubes indeed made better microscopes (we do not know if Spinoza had in mind the smallest of lenses, the ground drop-lenses that Hudde, Vossius and van Leeuwenhoek used, but he may have). It should be said that Huygens’ admission goes a long way toward qualifying Spinoza’s optical competence, for Spinoza’s claim could not have simply been a blind assertion for Huygens to have taken it seriously. Descartes to his pardon is writing only three decades after the invention of the telescope, and Spinoza three decades after that. Be that as it may, Descartes’ measure is simply too imprecise a measure in Spinoza’s mind, certainly not a factor significant enough to be called “incomparably the most important and the most significant of all”. 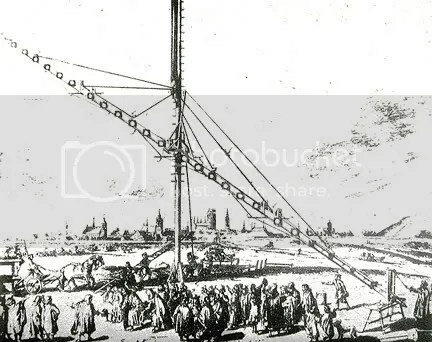 Because Jelles’ question seems to have been about the length of telescopes that would be required to achieve magnification of details of the surface of the moon (the source of this discussed below), it is to some degree fitting for Spinoza to draw his attention away from the analysis of the distance of the “burning point”, toward the more pertinent factor of the angle of rays as they occur at the surface of the eye and calculations of refraction, but it is suspected that he wants to express something beyond Jelles’ question, for focal and telescope length indeed remained a dominant pursuit of most refractive telescope improvements. And Spinoza indeed comes to additional conclusions, aside from Descartes imprecision. Spinoza suspects that Descartes is obscuring an important factor of lens refraction by moving the point of analysis away from the angle of rays at the surface of the eye. 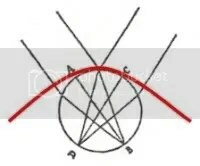 This factors is, I believe, the question of the capacity to focus rays coming at angles oblique to the central axis of the lens, (that is, come from parts of an object off-center to the central line of gaze). Spinoza feels that Descartes is hiding a weakness in his much treasured hyperbola. Descartes, in Spinoza’s view, wants to talk only of the crossing of rays closer to or farther from the surface of the eye, under a conception of physically lengthening the eye, and not the magnitude of the angle they make at the surface of the eye because he lacks the mathematical capacity to deal with calculations of refraction which involved rays coming obliquely to the lens. 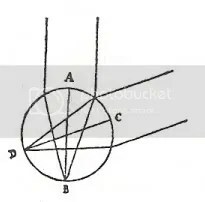 For simplicity’s sake, Descartes was only precise when dealing with rays coming parallel to the center axis of the lens, and so are cleanly refracted to a central point of focus, and it is this analysis that grants the hyperbola its essential value. In considering this reason Spinoza likely has in mind Descartes’ admission of the difficulty of calculation when describing the best shapes of lenses for clear vision. As well as the admitted problem of complexity, Descartes also addresses the merely approximate capacties of the hyperbola to focus oblique rays. Nonetheless, Spinoza suspects that Descartes has shifted the analysis of magnification not simply because it is not amenable to calculation, but more so because, had Descartes engaged the proper investigation, he would have had to face an essential advantage of spherical lense, lessening to some degree his hyperbolic panacea to the problems of the telescope. Again, we will leave aside for the moment Descartes’ justification of this approximation on the basis of the human eye and Nature. This is a very important point in the letter, for I believe it has been misread by some. At the same time that Spinoza seems to be asserting something painfully obvious in terms of the geometry of a circle, he, at first blush, in bringing this geometry to real lenses appears to be making a serious blunder. And, as I hope to show later, beneath both of these facts there is a subtle and deeper phenomenal-epistemic philosophical point being made, one that echoes through to the roots of Cartesian, and perhaps even Western, metaphysics. Let me treat the first two in turns, and then the third in parts. One’s immediate suspicions of error is readily confirmed by a straight forward application of Descartes Law of refraction. For the circle to have to the dioptrical property Spinoza claims, the refractive index of the glass would have to be a function of the angle of incidence, a condition of which there is not the slightest hint in the letter…[he is] apparently unaware of the importance the “[other] figures”…that Descartes had constructed (154). The problem with these readings, among many, is that Spinoza is not at all asserting that there exists such a lens which would have this refractive property (Gabbey’s concerns about Spinoza’s awareness of the Law of Refraction should be answered by looking his familiarity with Johannes Huddes “Specilla circularia”, in letter 36, which will be taken up later). I have corrected a weakness in the prominent English translation of the text which helps to bring out the distinction I am making. If one looks at the sentence closely, Spinoza is presenting an if-then assertion (he uses the subjective in the intitial clause). IF, and only if, a circular lens can be said to have the focusing property along axis AB, THEN it would have the same property along axis CD. To repeat, he is not asserting such a property in real glass and therefore he remits any refractive index reference because it is not germane to his point; he is only at this point emphasizing the property of an infinity of axes of focus, and he is using a hypothetical sphere for several reasons. The second reason is that Spinoza very likely is thinking of a real sphere, that is, the “aqueous globe” that Kepler used to investigate refraction in his Paralipomena, a work in which he was the first to articulate with mathematical precision the dynamics of spherical aberration (before there was a telescope, in 1604), and also was the first to suggest the hyperbola as the resolving figure for such aberration. Here is Kepler’s diagram of his sphere through which he gazed at various distances, illustrating his Proposition 14: “Problem: In an aqueous globe, to determine the places of intersection of any radiations parallel to an axis”. Thus, Spinoza’s use of a sphere in his diagram has at least two readings that have heretofore not been noticed. The first is that his description is operating at solely the hypothetical level, asserting the abstract properties of spherical symmetry, but secondly, he is referencing, or at least has in mind, a primary historical optical text, in all likelihood the text which spurred Descartes’ enthusiasm for the hyperbola in the first place (likely read by Descartes around 1620). It is precisely in this parallel fashion, between the geometrical and the manifest, that Spinoza seems to work his optical understanding. The third reason that Spinoza is using a full sphere to illustrate his principle of omni-axial refraction is that Descartes’ treatise deals not only with lenses, but also with the human (and ox) eye. 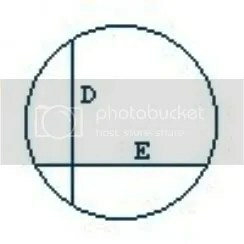 And this eye in diagrams is represented as a sphere. I will return to this point a little later, because as he encounters Descartes, he is making an argument, however loosely, against not only his optics, but his essential concepts of clear perception. By taking up a full sphere in his objection, he also poses a relation to Descartes schemas of the eye. Aside from Descartes’ pseudo-spherical diagram of the eye, we have to consider as an additional influence Hooke’s spherical depiction of the eye with two pencils of rays focused along different axes, used to illustrate the reception of color (pictured below left). The reason why I mention this diagram is not only because it bears some resemblance to Spinoza’s, but also because Hooke’s extraordinary Micrographia might have been the source of Jelles’ question, as I will soon address, and so may have been a text Spinoza thought of in his answer, though we are not sure if he ever read it, or even looked at it, as it was in published in English. Christiaan Huygens owned a copy of it and it was the subject of a conversation between the two. If Spionoza indeed visited the Hofwijck several times, it is hard to believe that he would not have looked closely at this page of diagrams. Spinoza here declares the exclusivity of a property that only spheres and their portions possess. It is hard to tell exactly at what level Spinoza is making his objection. Is it entirely at the theoretical level of optics that Spinoza believes hyperbolic lenses to be impaired, such that even if people could manufacture them with ease, they still wouldn’t be desired. If so, he would be guilty of a fairly fundamental blindness to potential advantages in telescope construction that such a lens would grant, rather universally understood. If indeed he was an accomplished builder of telescopes – and we have some evidence that he may have been – this would be a difficult thing to reconcile, forcing us to adopt an estimation of a much more craftsman level understanding of his trade. But it is possible that Spinoza is asserting a combine critique of hyperbolic lenses, one that takes into account the difficulty in making them. There are signs that spherical aberration after Descartes was taken to be a much greater problem than it calculably was, and Spinoza brings out a drawback to hyperbolic focus that adds one more demerit to an already impossible-to-make lens. Thus, as a pragmatic instrument maker he may not be assessing such lenses only in the abstract, but in reality. It may be that Spinoza sees the ideal of the hyperbolic lenses as simply unnecessary, given the serviceability of spheres, and the perceived advantage of oblique focus. This question needs to be answered at the level of optical soundness alone, but such an answer has to take in account the great variety of understandings in Spinoza’s day and age, even among those that supposedly “got it right”. For instance, such an elementary and widely accepted phenomena as “spherical aberration” was neither defined, nor labeled in the same way, by any two thinkers; nor were its empirical effects on lensed vision grasped. We often project our understanding backwards upon those that seem most proximate to our truths. Spinoza’s opinions on aberration seem to reside exactly in that fog of optical understandings that were just beginning to clear. …for through these it appears a very spacious Vale, incompassed with a ridge of Hills, not very high in comparison of many other in the Moon, nor yet very steep…and from several appearances of it, seems to be some fruitful place, that is, to have its surface all covered over with some kinds of vegatable substances; for in all portions of the light on it, it seems to give a fainter reflection then the more barren tops of the incompassing Hills, and those a much fainter then divers other cragged, chalky, or rocky Mountains of the Moon. So that I am not unapt to think that the Vale may have Vegetables analogus to our Grass, Shrubs, and Trees; and most of these incompassing Hills may be covered with so thin a vegetable Coat, as we may observe the Hills with us to be, such as the Short Sheep pasture which covers the Hills of Salisbury Plains. As one can see from this marvelous, evocative passage, the suggestion that the moon’s vales are pastorially covered with rich meadows, calling up even flocks of sheep before the mind, one can easily see that Jelles has something like this in mind when he asks what it would take to see objects on the moon, as we can see objects on the Earth. One might speculate that, having read such a passage, Jelles had a spiritual or theological concern in mind and excitment over the possibility of other people on the moon, but this would be perhaps only wistful supposition on our part. But it is too much to suppose that it was likely Hooke’s description of the moon Jelles was thinking of when he wrote his question to Spinoza, for not only are the details of an Earth-like moon present, but also Hooke’s urging of the reader to use a more power and much longer telescope than he used. Spinoza is responding directly to this aspect of telescope length. If we allow this supposition of a posed question on Jelles’s part, we might be able to construct something of Spinoza’s thinking in his response. It would seem, in our mind’s-eye, that Jelles had read Hooke’s description of the moon and his urge for a longer telescope and set about checking Descartes’ Dioptrics if it were the case that we really would have to build an extraordinarily long telescope to see the details that Hooke invoked (indeed Huygens built a 123 ft. arial telescope; and Hevelius one of 150 ft., pictured below). Following this evolution of the question, it would seem that Jelles came to Descartes’ treatment of magnification in the Seventh (and related) Discourses, one that defined the power of magnification by the all important distance of the crossing of rays from the surface of the eye, treating the telescope as an extended eye. 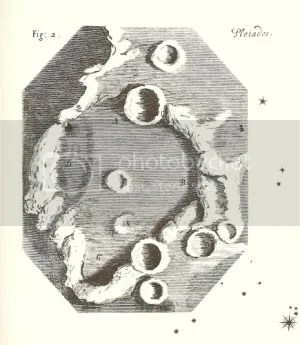 If indeed Jelles was not familiar with optical theory he may have taken this increase of distance for an explanation why telescopes had to be so very long to see the moon with desired detail. It would seem natural for Jelles to pose this question to Spinoza, who not only was regarded as the expert on Descartes in the Collegiant group, but also was a grinder of lenses and a designer of telescopes. If this hypothetical narrative of the question is correct, Spinoza responded in a slightly misdirected way, taking the opportunity to vent an objection to Descartes thinking which did not have acute bearing upon Jelles’s question. For Descartes’ description of a “burning point” distance and Spinoza’s emphasis on the angle of incidence of rays oblique to the center axis, makes no major difference in the conclusion that Jelles came to, that indeed it would take a very long telescope to do what Jelles imagined, and Spinoza admits as much, above. Yet, when Spinoza qualifies his answer “if no account is taken of anything except the focal lenth of the eye or of the telescope” he is pointing to, one imagines, factors of refraction, for instance in compound telescopes and lenses of different combinations, which do not obviate the contemporary need for very long telescopes, but may affect the length. Aside from this admission, Spinoza has taken the opportunity to express his displeasure over a perceived Cartesian obscurance, one that has lead to an over-enthused pursuit of an impossible lens, and as we have seen, in this context Spinoza puts forward his own esteem for the spherical lens, and the sphere in general. But this is no triffling matter, for out of Spinoza’s close-cropped critique of Descartes’ Dioptrics run several working metaphors between vision and knowledge, and a history of thinking about the optics of the hyperbola that originates in Kepler (made manifest, I contend, in a full-blown metaphysics in Descartes). Though Spinoza’s objection is small, it touches a fracture in thinking about the Body and Perception, a deep-running crack which might not have direct factual bearing on optical theory, but does have bearing on its founding conceptions. As I have already suggested, we have to keep in mind here that though we are used to thinking of a field of science as a closed set of tested truths oriented to that discipline, at this point in history, just when the (metaphysically) mechanical conception of the world was taking hold, it is not easy, or even advisable, to separate out optical theories from much broader categories of thought, such as metaphysics and the rhetorics of philosophy. For example, how one imagined light to move (was it a firery corpuscula, or like waves in a pond? ), refract and focus was in part an expression of one’s overall world picture of how causes and effects related, and of what bodies and motions were composed: and such theories ever involved concepts of perception. Spinoza reiterates his point that it is the intersecting angles of incidence at the surface of the eye which determined the size of the image seen through a telescope. He finally connects the factor of the angle of incidence and intersection to the foci of lenses themselves. It is tempting to think that Spinoza in his mention of lenses is also thinking of compound forms such as the three-lens eyepiece invented by Rheita in 1645, or as he was already familiar through visits to Christiaan Huygens’s home in 1665, proposed resolutions of spherical aberration by a complex of spherical lenses. Such combinations would be based upon angle of incident calculations. Spinoza will send this evidence in his next letter (pictured at bottom). Jelles has apparently had some difficulty with understanding Spinoza’s explanation. It is interesting because this confusion on Jelles’ part has actually been taken as evidence that Spinoza not only is impaired in his understanding of optics (this may be the case, but Jelles’ confusion, I don’t believe, is worthy of being evidence of it), but that those close to Spinoza around this time became aware that Spinoza’s optical knowledge was superficial at best, something not to be questioned too deeply. In his next letter…to Jelles, who has asked for a clarification, Spinoza explained that light rays from a relatively distant object are in fact only approximately parallel, since they arrive as “cones of rays” from different points on the object. Yet he maintained the same property of the cirlce in the case of ray cones, apparently unaware of the importance of the “[other] figures” [the famous “Ovals of Descartes”] (154). It seems quite clear that Spinoza was aware of the “importance” of these figures, at least he was aware of Hudde’s and Huygens’ attempt to minimize that importance. But Gabbey here seems to suggest that Spinoza is evading a point of confusion by simply changing descriptions, instead of parallel rays of light, Spinoza now uses “cones of rays”. For these reasons of suspicion it is better to go slow here. One can see how in this context Jelles may have been confused by Spinoza’s diagram of the focus of two pencils of rays, and even by the accusation that Descartes is being somehow imprecise, for the illustration seems to depict rays as something like cones of rays, not rays flowing parallel to an axis, as they are in Spinoza’s drawing. Aside from this plain confusion, Jelles’ question may have dealt with some other more detailed aspect, for instance, a question about the importance of a lens’s ability to focus rays oblique to its center. 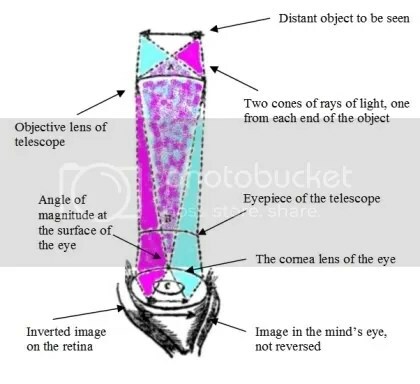 If so, Spinoza would require not only that Jelles understand that rays come in cones, but also have a fuller sense of how those rays refract upon the eye, perhaps provided by the diagram that will follow. In either case, rather than understand Spinoza’s change in descriptive terminology as an attempt to dodge his incomprehension, Spinoza simply appears to be guiding Jelles in the reconsilation of both kinds of diagrams, or preparing ground for a more complete explanation. This passage has multiple points of importance, in part because I suspect that it is the orgin passage of Descartes’ enthusiasm for the hyperbola, but also, as I will show later, for a naturalized justification for hyperbolic vision, something which will play to Spinoza’s optical critique. But at this point it is just sufficient to register the citation as a reference point for Spinoza’s phrase. We have already pointed out that Spinoza may have Kepler’s aquaeous globe in mind for his intial diagram, so there is something distinctly Keplerian in Spinoza’s approach. 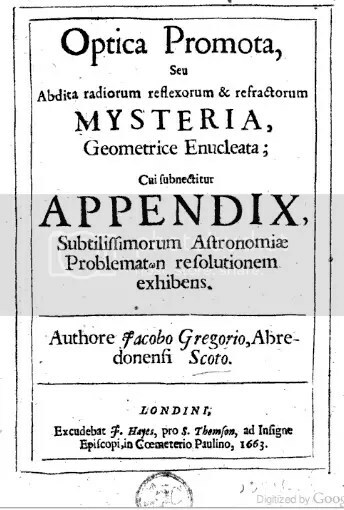 Another reference point for Spinoza’s phrase is James Gregory’s 1663 Optical Promota, a treatise written without the aid of Descartes’ Dioptrics, but which all the same proposed parabolic and hyperbolic solutions to refraction aberrations and proposed reflective mirror telescopes to avoid the problem altogether. This text we know Spinoza had in his personal library, and he seems to be reasoning from it in part. Gregory regularly uses both “pencils of rays” and “cones of rays” as modes of analysis. 6. Parallel rays are those which are always equally distant each to the other amonst themselves. 7. Diverging rays are those which concur in a point when produced in both directions: those rays produced in the opposite direction to the motion from the ray-bearing cone – the apex of the cone is the point of concurrence of the rays. 10. An image before the eye [i.e. a real image], arises from the apices of the light bearing cones from single radiating points of matter brought together in a single surface. Pencils of parallel rays feature in many of the diagrams, within the understanding that rays proceed as cones. So seems to me that Spinoza is operating with both Kepler and Gregory in mind as he answers Jelles’ question. Spinoza may be still addressing the nature of Jelles’ request for clarification. He follows the reasoning of Gregory’s Tenth defintion (above). Whether the rays be treated as parallel pencils, or cones does not make a strict difference to Spinoza’s point, though understanding that they are coming to the lense as cones does something to express their spherical nature (one must recall that Kepler asserted that light radiates as a sphere as it can, and even that Hooke proposed that it moves in waves; Spinoza’s attachment to the sphere may be in regards to this). It is the lens’ capacity to gather together these rays come from diverse points of the object, and not just rays parallel to its central axis, that Spinoza emphasizes. In other words, though considered no more than a point, it is a point that must gather rays from a variety of angles. It should be noted that Spinoza is talking about glass lenses here, and not the eye’s lens. Spinoza has taken his ideal model of a spherical refraction from the first letter, and has applied it to actual lenses (there is no requirement to the index of refraction of the glass). As Spinoza envisions it, because a glass has to focus rays coming obliquely, the foci along those alternate axes are significant factors in clarity. This is the big sentence, the one that opens up the place from which Spinoza is coming from. What does Spinoza mean “the eye is not so exactly constructed”? How odd. Descartes’ comments on optics indeed are often made in the service of correcting far- and near-sightedness, so there is context for a notion of the “inexactness” of the eye, and for his own uses Descartes picks up on the notion that the eye is limited or flawed: …”in as much as Nature has not given us the means…”, “I still have to warn you as to the faults of the eye”. But this is not what Spinoza has in mind. What I believe Spinoza is thinking about is the hidden heritage behind a naturalizing justification of hyperbolic vision itself. This is not strictly an optical point, as we have come to understand optical theory, but an analogical point. And this distinction organizes itself around the failure that a hyperbolic lens to handle rays oblique to its axis, with clarity, and whether this failure is something to be concerned with. This is a striking passage in that we know the history of the hyperbolic lens, and Descartes’ fascination with it. Due to the hyperbolically shaped crystalline humor (as Kepler reasons it), the image at the border, projected at the edges of the retina, is said to be more confused due to the inability of the lens to focus oblique rays. This is what Spinoza has in mind when he says that the eye is not so exactly constructed. But there is more to this passage. Not only is the image more confused, but Kepler goes so far was to qualify this confused quality as an explanation for why the soul is dissatisfied with oblique vision. At the margins of blurred vision, according to Kepler, the sides of the retina do not “sense” for their own sake, but for the sake of central axis perfection, in effect serving the center. Kepler has provided the hyperbola as the solution for spherical aberration, but has also couched that shape within a larger context of human perception and the nature of what experience satisfies the soul or not. But against hyperbolic lenses, it is only objected that nothing will be able to be most clearly seen, except a visible point arising on the axis of the instrument. But this weakness [ infirmitas ] (if it would be worthwhile to call it that) is sufficiently manifested in the eye itself, though not to be impuning Nature, for whom nothing is in vain, but how much all things most appropriately she carries out [ peragit]. Nevertheless, withconicallenses and mirrors not granted, it shall be rather with spherical portions used in place of spheriods and paraboloids in catoptrics; as with hyperboloids in dioptrics, in which portions of spheres are less appropriate. Just as Kepler justifies hyperbolic vision by appeal to the eye’s own weakness, redeemed by the roles of the retina and the satisfactions of the soul, so here too Nature herself is the justification of central axis priority. This is a curious naturalization, given that so much of optics addresses the failings or the limitations of Nature. Such a self-contradiction deserves attention, especially with a focus upon the foundations of valuations that make one adjustment to Nature desired, and another not. But here I would like to continue the line of justifications of the hyperbola through the construction of the eye that Spinoza likely has in mind. There is additional evidence for the naturalized justification of the hyperbolic “weakness” (notice the question of valuation in the phrase “important one”). Firstly, when he proposes his notion that the telescope is simply an extension of the eye, Descartes imagines that all the refraction would occur in one lens, thus, “…there will be no more refraction at the entrance of that eye” (120). In this analogical conception of the extended length of the eye Descartes imagines his hyperbola as supplimenting and even supplanting the eye’s refractions. Secondly, when Descartes addresses the possibility that seeing at the borders may be an improvement of vision, he denies this, by virtue of how Nature has endowed our sight. Seeing more is not seeing better. One feels that there seems something of this ideal conception of the densest medium floating behind Spinoza’s conception of the spherical lens. Material glass somehow manifests for Spinoza, in its particularities of modal expression, these geometric powers of unified focus, and peripheral focus is a part of what Spinoza conceives of as ideal clarity. But there is another very important clue in this section of the letter: the phrase “using the language of Mechanics”); for now I believe we get direct reference to Johannes Hudde’s optical treatise “Specilla circularia” (1655), an essential text for understanding Spinoza’s approach to spherical aberration. At the basis of Hudde’s solution to the problem is his distinction between mathematical exactness and mechanical exactness. Whereas the first is exactness according the laws of mathematics, the second is exactness as far as can be verified by practical means. After having made this distinction, Hudde claims that parallel incident rays that are refracted in a sphere unite into a mechanically exact point (“puntum mechanicum”). In order to substantiate his claim Huddethen proceeds to the explicit determination of the position of a number of rays after refraction. Restricting his investigation to the plane, Huddeconsiderstherefraction of seven parallel rays by explicitly computingthepoint of intersection of these rays with the diameter of the circle parallel to the incident rays for given indices of refraction. The closer these rays get to the diameter, the closer these points get to one another until they finally merge into one point. Today, we would call this point the focal point of the circle; Hudde does not use this term. Returning to spheres, Hudde erects a plane perpendicular to the diameter introduced above and considers the disc illuminated by the rays close to this diameter. He refers to this disc as the “focal plane”. On the basis of the same rays he used earlier, Hudde concludes that the radius of the focal plane is very small compared to the distance of the rays to the diameter. Therefore this disc could be considered as one, mechanically exact point. In other words, parallel rays refracted in a sphere unite into one point (111-112). From this description one can immediately see a conceptual influence upon Spinoza’s initial diagram of spherical foci, and far from it being the case that Spinoza knew nothing about spherical aberration and the Law of refraction, instead, it would seem that he was working within Hudde’s understanding of a point of focus as “mechanical”. We know that Spinoza had read and reasoned with Hudde’s tract, as he writes to Hudde about its calculations, and proposes his own argument for the superiority of the convex-plano lens. And the reference to “the language of mechanics” seems surely derived straight from Hudde’s thinking. What these considerations suggest is that Spinoza’s objection to the hyperbola to some degree came from his agreement with Hudde that spherical aberration was not a profound problem. As it turns out, given the diameters of telescope apertures that were being used, this was in fact generally correct. Spinoza joined Hudde in thinking that the approximation of the point of focus was the working point of mechanical operations, and the aim of shrinking it down to a mathematical exactness was not worth pursuing (perhaps with some homology in thought to Descartes’ own dismissal of the approximations of focus of rays oblique to the axis of the hyperbola). Until this day it is believed that spherical surfaces are…less apt for this use [of making telescopes]. Nobody has suspected that the defects of convex lenses can be corrected by means of concave lenses. (OC13-1, 318-319). In the optimal lens the radius of the convex objective side is to the radius of the convex interior side as 1 to 6. EUPHKA. 6 Aug. 1665. When I asked Huygens about his Dioptricsandabout another treatise dealing with Parhelia he replied that he was still seeking the answer to a problem in Dioptrics, and that soon as he found the solution he would set that book to print together with his treatise on Parhelia. However for my part I believe he is more concerned withhisjourneytoto France (he is getting ready to to live in France as soon as his father has returned) than with anything else. 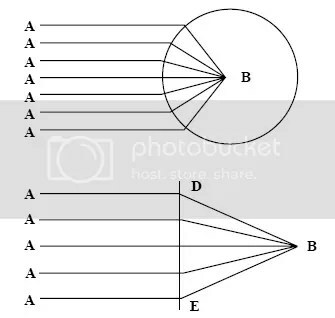 The problem which he says he is trying to solve in the Dioptrics is as follows: It is possible to arrange the lenses in telescopes in such a way that the deficiency in the one will correct the deficiency of the other and thus bring it about that all parallel rays passing through the objective rays will reach the eye as if they converged on a mathematical point. As yet this seems to me impossible. Further, throughout his Dioptrics, as I have both seen and gathered from him (unless I am mistaken), he treats only spherical figures. This letter is dated October 7, 1665, two months after Huygens had scribed his Eureka optimalization of the lens shape. Significantly, Huygen found that lenses of this optimal shape actually were not the best for his project of combining lens weaknesses (302-303), rather lenses with greater “weaknesses” were better combined. Several facts can be gleaned from Spinoza’s letter, and perhaps a few others guessed at. Spinoza had both looked at and discussed with Huygens his contemporary work. So the sometimes guarded Huygens was not shy about the details of his project with Spinoza. It may well have been Huygens’ treatment of the convex-plano lens here that caused Spinoza to write to Hudde less than a year later with his own calculations in argument for the superiority of the convex-plano lens, using Hudde’s own Specilla as a model. (Hudde seemed quite interested in Spinoza’s proofs of the unity of God, and the correspondence seems to have begun as early as late 1665.) What cannot be lost is that with a joint awareness of both Hudde’s and Huygens’ attempts to resolve spherical aberration, Spinoza was in a very tight loop of contemporary optical solutions to the problem. Not only is his scientific comprehension trusted by both Huygens and Oldenburg at this point, but perhaps also by Hudde. What is striking though is Spinoza’s pessimism toward Huygens’ project. Given Spinoza’s optical embrace of spherical lenses (in the letters 39 and 40 we are studying), what would lead Spinoza to such a view he qualifies as “As yet this seems to me impossible.” Is this due to a familiarity with Huygens’ mathematics, and thus comes from his own notable objections? Has Huygens actually shared the frustrations of his experiments? Or is he doubtful because Spinoza has only a vague notion of what Huygens is doing? He seems to deny the very possibility of achieving a mathematical point of focus, though his mind remains tentatively open. His added on thought, Further, throughout his Dioptrics, as I have both seen and gathered from him (unless I am mistaken), he treats only spherical figures” , is also curious. He seems privy to the central idea that Huygens is using spherical lenses to achieve this – what other figure would it be? – but it is possible that Spinoza here qualifies his doubt as a general doubt about sphericals which he only believes Huygens is using in his calculations, showing only a cursory knowledge. Perhaps it is only an addendum of information for Oldenburg. “With concave and convex spherical lenses, to make telescopes that are better than the one made according to what we know now, and that emulate the perfection of those that are made withellipticor hyperbolic lenses” (OC13, 318-319). I am unsure if he had come to this solution before he left for Paris in mid 1666, or if he would even have shared this discovery with Spinoza, but he also came to the same pessimistic conclusion as Spinoza held, at least for Keplerian telescopes, for his design only worked for those of the Gallelian designs which had fairly low powers of magnification. By combining convex lenses the aberration was only increased. This would be the case until February of 1669, when Huygens finally came up with right combinations of lenses. Again Spinoza returns to his initial point, now putting it in context of real telescopes. Such telescopes required the stopping down of the aperture, something that reduced the impact of spherical aberration; but restricting the aperture reduced the amount of light entering the tube, hence making the image less distinct. I am unsure what Spinoza refers to in “as you may easily see”, for neither of his diagrams seem to distinctly address this aspect. Perhaps Spinoza has in mind two diagrams of the eye that Descartes provides, contrasting the angles of rays entering the eye with a narrow and a wide pupil aperture. Was this a diagram which Jelles had mentioned in his response (below, left)? I am unsure what Spinoza means by “both the foci”, but it appears that he asserts again that because there is only one axis of either hyperbolics or ellipse available to any rays of light arriving for refraction, and that spherical lenses, again, have the advantage that rays come from any particular point of an object then can be focused to a single “mechanical point” along an available axis. Under Spinoza’s conception, this is an advantage that cannot be ignored. Below I post Spinoza’s last diagram to which he refers with his final remarks. I place it beside Descartes diagram to which it most likely refers. This may be the most telling aspect of Spinoza’s letter, for we have to identify just what Spinoza is making clear as distinct from what Descartes was asserting. There are several ways to look at Spinoza’s diagram, but it is best to take note of where it diverges from Descartes’ (for Jelles would have had the latter to compare it to). The virtual image of the arrow appearing to be much closer to the eye is eliminated, presumably because the appearance of magnification is not in Spinoza’s point. The refraction of the centerpoint of the arrow remains, and is put in relation to refractions of rays coming from the extreme ends of the arrow. The refractions within the eye have been completely collapsed into an odd, artfully drawn eye, (the touch of lid and lashes actually seem to speak to Colerus’ claim that Spinoza was quite a draftsman, drawing life-like portraits of himself and visitors). Behind this collapse of the eye perhaps we could conclude either a lack of effort to portray his version of refractions into the mechanisms of the eye, or even a failure of understanding, but since this is just a letter to a friend, it probably marks Spinoza’s urge just to get a single optical point of across, and he took more pleasure in drawing an eye than he did tracing out his lines of focus. An additional piece of curiousness, which may be a sign of a very casual approach is that the last arrow in the succession, which to my eye appears to be one supposed to be in the imagination of the mind, Spinoza fails to properly reverse again so that it faces the same direction as the “real” one, although perhaps this is an indication that Spinoza thought of the image as somehow arrived within the nervous system at a point, on its way to be inverted by the imagination (though in the Ethics he scoffs at Descartes’ pituitary concept of projective perception). There is of course the possiblity that I am misreading the diagram, and the the final arrow somehow represents the image as it lies on the retina at the back of the eye. At any rate, it is a confusing addition and one wonders if it is just a part of Spinoza’s musings. The first thing to be addressed, which is not labeled here, is what C is. There is the possibility that it is a crude approximation of the crystalline humor, acknowledged as a refractive surface. If so, the upper arc of the eye and the figure C would form some kind of compound refractive mechanism approximate to what Descartes shows in his eye, here compressed and only signified. But I strongly suspect that C is the pupil of the eye, as the aperture of the telescope has been recently has been referred to in terms of its effect on the requirements of refraction, and in Descartes text there is a definite relationship between the telescope aperture and the pupil of the eye (it has also been proposed to me that C is the eyepiece of the telescope). The primary difference though is the additional emphasis on the cones of rays that come from either end of the object to be seen (here shaded light blue and magenta). This really seems the entire point of Spinoza’s assertion, that spherical lenses are needed for the non-aberrant focus of oblique cones for a object to be seen clearly. 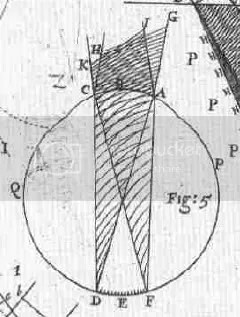 In addition to this, the angle that these rays make at the surface of the eye (indicated) points to Spinoza’s original objection to Descartes incomplete description of what is the most significant factor the construction of a telescope. What remains is to fully assess this conception of refraction that Spinoza holds. While it is made in the context of historic discussions of the blurred nature of the borders of an image’s perception, it is also true that such an oblique focusing must occur, however slightly, at any point exactly off from the center axis of a hyperbolic lens. It may well be that Spinoza is balancing this aberration of focus in hyperbolic lenses with the found-to-be overstated aberration of spherical focus. Given his comprehensive conception of clear mental vision -seeing more is seeing better – and its attendant critique of the Cartesian Will, given his love for the sphere, perhaps aided by a spherical conception of the propagation light come from Kepler, with Spinoza being much sensitized to the absolute impracticality of ground hyperbolic glasses through his own experiences of glass grinding, it may have been quite natural for Spinoza to hold this optical opinion…though it is beyond my understanding to say definitively so. This is a curious ending for such a wonderful letter. Perhaps we can assume that once again the editors of his Opera suppressed important personal details.